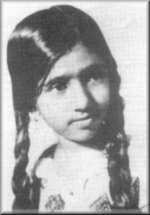 Latabai Mangeshkar was born on 28th September, 1929, at Sikh Mohalla, Indore, Madhya Pradesh, India. Her father was Pt.Deenanath Mangeshkar a classical singer & stage actor, who came from Mangeshi in Goa. He was a classical singer trained in the colourful Punjabi school of Baba Mushelkar. He owned a drama troupe which made him pitch his tent in nearly every town - such as Pune, Kolhapur, Satara, Sangli and Miraj. 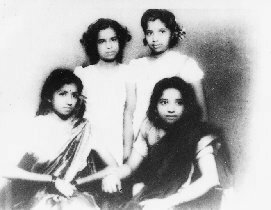 Mother:Shudhhamati & their children, four daughters and a son (Lata, Meena,Asha, Usha & Hridaynath) did not receive a proper schooling However to compensate this shortcoming he gave his children music lessons early in life. Lata said, "The foundation of my musical propensities was laid as early as that". She was referring to the early reposure to music. They appeared as child artistes and sang on the stage whenever they were needed. Lataji says her father told her mother that she is going to be a miracle since he knew a little about astrology though he died before she started singing. Her first Hindi song(but in a Marathi Film)1943 - Gajabhau (maata ek sapoot ki duniya badal de tu...)Vinayak Rao was happy with Lata's performance and signed her as a staff artiste on a monthly salary of Rs. 60. It was increased to Rs. 350 by the time Vinayak died in 1947.In 1945 the company shifted its headquarters to Bombay. Lata moved out into the big city. It was then Lata met Amanat Ali Khan Bhindibazarwala, a classical scholar who accepted her as a disciple. In Badi Maa (1945),starring Noorjehan, Lata acted, sang for herself and for younger sister Asha. When Pakistan was created, Amanat Ali left India. Thereafter, she also became the pupil of Ustad Amanat Khan Devaswale. For some time Pandit Tulsidas Sharma, who was a pupil of Ustad Bade Ghulam Ali, also trained her. Finally her first song as a playback singer in hindi films was in 1947 - Aapki Sewa Mein (paa laagu kar jori...)but this song did not give lata recognition as a singer. With Vinayak's death, Lata once again had no fixed income. She approached Ghulam Haidar, a close friend of Amanat Ali, a leading music director. Haidar noticed the range and sweetness of Lata's voice,took her to Subodh Mukherjee who rejected her by saying that "Is ki awaaz to bahut patli hai" & would not match with that of the heroine, Kamini Kaushal, since those days, there were singers like Rajkumari Dubey, Amirbai Karnataki, Shamshad Begum,Noorjehan, Zohrabai Ambalewali, Geeta Dutt & Suraiyya. 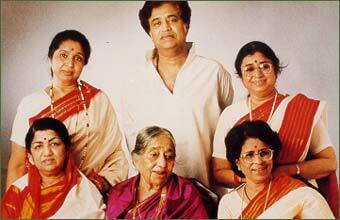 Lata's singing was so different from these singers. Mst Ghulam Haider who launched Lata's illustrous career was outraged on the tone-deaf producer & prophesied "Let me fortell today that this girl will soon put to shade everyone else including Noor Jehan. Producers & singers will fall at her feet begging to sing in their films. "On the same day Lata went with Haidar to the studios of Bombay Talkies at Malad. On the platform of Goregaon station, Haidar asked Lata to sing the same song that she had sung for Mukherjee. It was raining. The trains whistled in and out. In the midst of the noise of commuters and vendors she sang. An hour later Lata sang the same song at Bombay Talkies where she was selected to sing for Majboor. Lata said, "I never looked back since than." It was not an easy task. It was recorded at the 32nd take. Among those present at the recording were the leading music directors like Hussein Lal Bhagatram, Anil Biswas, Naushad and Khemchand Prakash. The first to come forward was Naushad. He signed Lata for Andaaz, a smashing box office success. Afterwards Bhagatram signed her for Badi Bahen. Then came Barsat. Fame came quickely to Lata but not big money.